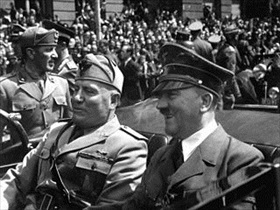 Left: Mussolini and Hitler review Nazi Party troops parading before one of two “Honor Temples” (Ehren­tempel) on Koenigs­platz, Munich, Septem­ber 25, 1937. Musso­lini’s visit to Munich, Berlin, and Essen, the Euro­pean capital of the steel and arma­ments indus­tries, cost Ger­many mil­lions of Reich marks. Both dic­ta­tors used the occa­sion to cement bi­lateral ties of friend­ship, which had first been laid down in a friend­ship pact signed by their for­eign minis­ters in late Octo­ber 1936. The Ger­mans were rewarded with assur­ances from the Ital­ians that “special Ger­man inter­ests in Aus­tria would not be opposed by Italy,” a green light for the March 1938 Nazi take­over of Austria (Anschluss). 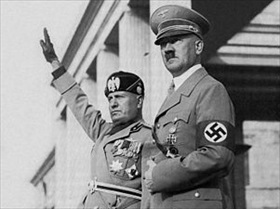 Right: Mussolini visited a clearly triumphant Hitler on June 18, 1940, driving through Munich’s streets in an open car and holding discus­sions with his Axis part­ner on how to divvy up French spoils as all signs pointed to a Franco-German armis­tice. The discus­sions were held in the Fuehrer­bau in the same room where he, Hitler, French Premier Édouard Dala­dier, and Brit­ish Prime Minis­ter Neville Chamber­lain had divvied up Czechoslovakia in September 1938.